Eight months old! I can’t believe it. (I also can’t believe the person moving trash cans outside right now while Tucker naps; it sounds like they are throwing them on the ground from about 10 feet up. City living, right?) This is going to be a short one because we’re heading to Long Island for Easter around lunchtime and I still haven’t packed. Last Friday we went to visit Ben at the office for lunch, and Tucker got to see all his coworkers. He took an immediate liking to one of them, and spontaneously started waving, clenching his hand and releasing it over and over. I thought it might be a fluke, but ever since he’s been waving at everyone! Sometimes it seems like he’s saying he wants something, but other times he’s clearly reaching out to say hello. He also holds the hand out all the way and waits for you to touch it with your hand, and then he grins and buries his head in my shoulder. That cuteness aside, it’s been a rocky week. He’s had a fever since Monday--not too high, but he hasn’t been himself. That did lead to a couple crazy-long naps in the afternoons, but the morning naps have been short and his temper has been shorter. I also think there might be another tooth coming in. One new toy this week, the Sassy “Ring of Links,” which is....well, a ring. With links on it. The links on other toys tend to be one of Tucker’s favorite things to chew on, so I figured this was a can’t miss. He like thrashing them around and chewing on them, but honestly he’s been so off-kilter this week that I can’t judge how much he’s enjoying anything. We did have another exciting product come in for testing, though. We never bought an excersaucer because I couldn’t bear to commit to something that bulky, plus we’ve drawn a pretty hard line on avoiding battery-operated toys as much as possible. But as Tucker gets bigger and quicker it’s getting harder and harder to find a safe place to put him down if I need to get something done. He can arch most of the way out of the Bumbo if he wants to, and he definitely doesn’t stay put just sitting or lying on a mat. A while ago a friend had shown me a collapsible standing-support/containment-pod thing in a catalog, and when I finally figured out who made it, I got in touch with to see if I could try one out. It’s called the Go-Pod (the same company, Kidco, also make the popular PeaPod sleep tent travel bed, which I will also be testing in the next few weeks), and it’s totally brilliant. Basically it’s a metal frame exactly like a foldable beach chair—the nylon type that collapses down and goes in a carrying bag with a strap. 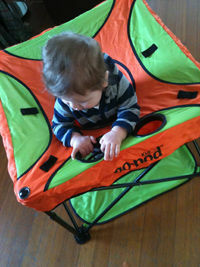 Instead of opening out into a chair, the Go-Pod opens into a cube with a seat and cup holders and loops for attaching toys. The baby stands in the middle and can look around and play without a chance of escaping. There are four height settings, so you can adjust it to fit. I popped Tucker in as soon as it arrived, and he loved it! I didn’t even add toys at first, because he enjoyed the cup holders so much (see photo). The first day he stood up in it really well, though when he’s wearing a sleeper without non-skid coating he ends up skidding around a bit and lounging back more. We’ve been hanging out in the dining room while I eat my breakfast every morning; Tucker stands in the pod and watches me, and opens his mouth like a little bird to demand bits of toast. Between nibbles he plays with whatever is hooked onto it, and he’s happy as a clam for as long as we sit there. By the way, the Go-Pod comes in three different color combinations, from very bright to very muted. And it really does fold up small. We’re taking it to Long Island with us this weekend; it’s perfect for travel. (Car travel, that is!) You can buy it at Babies R Us, Amazon, or a lot of toy stores. I’m thrilled—this will make cooking dinner *much* easier. Kate Flaim is a freelance journalist and food blogger based in Cambridge, Massachusetts.